Guess what, it’s now less than six weeks until Christmas! Yay! The Planet Coaster Beta has arrived just prior to the full release later this week. You might have read that I got that chance to play the Alpha a few weeks back. Well now that the Beta has dropped there is a lot more content to play with. 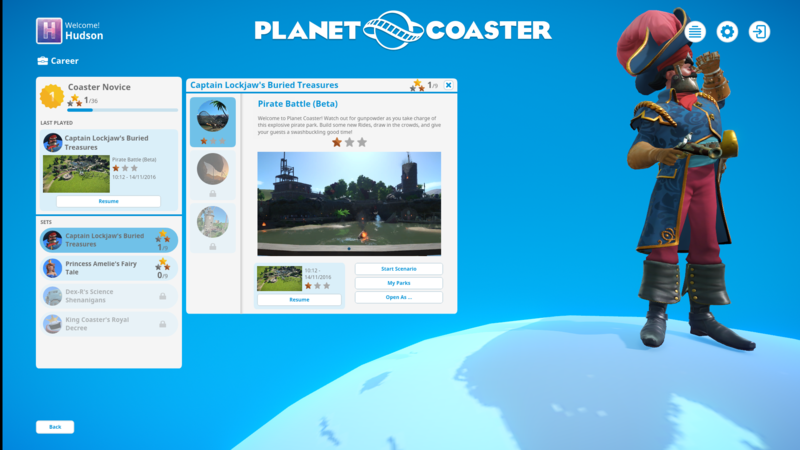 You now have various scenarios you can play through with different levels of objectives, there is a more in depth park management system where you can research rides and attractions and get a better handle on what your guest think of your park. But the one that most people will be happy about is the addition of new rides, attractions and park decorations, you can now have water rides, there is a new Sci-fi park theme. There is loads, and a lot more to come too. I’ve only managed to play a little bit of the Beta since it launched but I can already see that there have been huge improvements across the board and I’m really excited about the depth and level of details that this game has. You really can create to your hearts content, almost anything you could imagine you can pretty much create if you put enough time in to it. I really do think that Planet Coaster will hold the reins of Roller Coaster SIm Royalty for a long time. The full game releases 17th November. I’ve mentioned a few times how much I love Gwent, well last week I put my thoughts in to words and gave my first impressions of the Beta, you can read them here. Another new release that I’ve spent a little bit of time on is Beholder from Warm Lamp Games. Set in a dystopian future a totalitarian state controls every aspect of life, you’re the state installed manager of a block of apartments and your job is to spy on your tenants, log suspicious activity and then choose whether or not to report them to the authorities. The game has a very unique and interesting art style that I really like. I haven’t played a whole deal of the game yet, but so far it seems good, I like the almost dark humour to it, I like the setting and it’s looking like a very promising game that I’m really eager to play more of. I’ve always thought the PS4 Pro seemed a little rushed and that it didn’t need to be put out this quickly and it seems like that could be the case. Digital Foundary have been testing the limits of what the PS4 Pro can achieve in terms of both visuals and performance it looks like the machine just can’t handle 4k 60 FPS, which in my opinion should be the target, 4k 30 FPS isn’t something I’d want to play. It also seems that with some games it can’t quite reach true 4k which I think is a shame. The performance of The Last of Us, to me, is a particularly disappointing one with t he standard PS4 achieving a better and more stable frame rate throughout. Ok, the frame rate isn’t terrible with only a few drops here and there, but to me it just further cements the fact that they should’ve waited a bit longer and actually released the machine when it could hit 4k and 60FPS. I wasn’t really considering getting one anyway, but this news really doens’t do anythiny to try and change my mind.